Signs Your Furnace Wants to Call it Quits | Sound Heating & Air Conditioning Inc.
« Springtime Means it’s Time for a Tune-Up! Spring is upon us, temperatures are warming, and you’re likely about ready to turn off your furnace for the season. Hopefully, your furnace provided you with powerful heating and reliable performance all winter long. But like any other type of complex appliance, a furnace can malfunction and require attention from trained professionals. We offer exceptional furnace service in Tacoma, WA to ensure you get your furnace back on track. 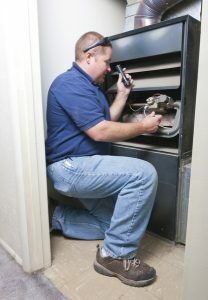 However, in order to contact our team for furnace repairs, you first need to know that those furnace repair needs exist. After all, some heating problems can be hard to spot at first—things like damaged ductwork or insufficient insulation. We want to help you detect furnace problems as early as possible so you’re not stuck with an unbearably cold home when fall circles back around at the end of the year. So what should you watch, and listen, for? If you’ve had your furnace for even just a short couple of years, you’re likely familiar with the sounds it makes when it operates and goes through its heating cycles. When your furnace becomes excessively noisier than usual, however, or you hear noises you don’t recognize, something is probably wrong. Odd noises can manifest in the form of mechanical shrieking, indicative of motor bearings running down, grinding, which indicates motors in need of lubrication, or clicking. This later sound—clicking—is the sigh that you have cracks in the heat exchanger that are allowing contaminated air into your home. Please be sure to call in a professional right away if you suspect this is the case. That is, your furnace is turning on and off rapidly. This can be indicative of a number of problems, and can also cause problems. Something, in this case, is causing the furnace to finish its heating cycle too early, and this puts immense stress on the components, raising your energy costs, and doesn’t give your furnace enough time to send heat evenly through your living space. The trouble could be caused by a clogged air filter, which is something you can and should replace on your own. Alternatively, the trouble could be that your furnace is too large for your home. Of course, if this were the case you would have noticed short-cycling as soon as your furnace was installed and you went to use it for the first time. If your first heating bill was much higher this year than in previous years, or much higher than what your neighbors are paying, then it’s a sign that something is causing your heater to behave inefficiently. This can be caused by a number of different problems, but whatever the cause is, we can help you. Any sort of malfunction in your furnace can cause it to work harder than it should have to in order to do its job, and as a result your utility bills will spike.